The implemented infrastructure projects through MISP program are identified as essential component for development of the Municipalities as well as for improvement to living standards. During the Works Implementation period, the best standards of EU integration, transparency in the process will be promoted through the introduction of the PRAG Works Contracting and Supervision practices. The Road Rehabilitation Project in Eastern Serbia was a complementary EU support to the development of Eastern Serbia, fostering improvement of economic development through improving road network. The project consisted of 2 lots – one lot supported by the EAR and one lot supported by the Serbian Road Directorate – with each lot representing 50 % of the overall financial project volume. The project consisted of construction of Water Treatment Plant and Reconstruction of Water Wells and Pumps. EAR donated 2.4 mil Euro for realization of the project. Implementation period was 12 months. New WTP and improved installations will help to get better quality of water in region and to improve quality of life for the citizens of Inđija. Surplus activated sludge treatment in line with the EU standards. Energy efficiency increase of the waste water treatment system. Safe and modern treatment of surplus activated sludge. Protection and improvement of soil, air and surface water quality. A new regional sanitary landfill that will be used for reliable and safe disposal of communal waste. The proposed solid waste management scheme is fully in accordance with the Serbian Waste Management Strategy. A new access road to the land fill site. New collection trucks and containers. Total budget is 11,188,546 €The project does not have negative impact on the environment and the Environmental Impact Assessment was accepted by the Serbian Government and the European Agency for Reconstruction. Development of a transfer station in Šabac and main disposal site in Sremska Mitrovica with full infrastructure according the prevailing regulations and directives requirements for a standard Waste Management System. To increase recovery and recycling of packaging waste (glass, paper, cardboard, metal and plastics). To create preconditions for economic and social sustainable development in the region. Phase II (not included in current investment project) potential extension of the Waste Water Treatment capacity by 60.000 PE (to total capacity of 180.000) – subject to demand. The CWWTP would treat sewage discharges from Vrbas and Kula towns, villages of Vrbas municipality and pre-treated industrial wastewater for identified industries. Additional sanitary sewerage system shall be constructed in: Kucura, Zmajevo, Bačko Dobro Polje, Ravno Selo and Savino Selo, and would include the following: 83,2 km of collection network, 30 km of transmission main and 22 small pumping stations. The extension of the sanitary sewerage collection system will significantly improve the coverage in waste water collection, and will substitute current practice relying on individual septic tanks that represent potential source of pollution of ground and surface waters, and serious health hazard. Through the project the urban area of Vrbas and the 5 villages are to be fully covered, including a connection to the CWWTP. It is further planned to connect the sanitary sewerage system of Kula and Crvenka to the CWWTP by constructing the main sewer line between Kula and Vrbas, and corresponding sewage pumping stations. Sections I to IV of the main sewerage line between Kula and Vrbas have already been completed, whereas section V (some 2,6 km long) is constructed during 2011. The plant will initially be constructed (Phase 1A) to provide a treatment capacity for a population equivalent of 84,000. Under Phase 1B the plant will be extended to provide a total treatment capacity for a population equivalent of 126,000. To protect and improve surface water quality of the River Sava by treating the collected and transported industrial and communal wastewater. The project is in line with EU directives and with Serbian legislation and regulations. To improve standard of service in wastewater collection. To avoid pollution of both underground and surface waters, and serious health hazard by current use of sceptic tanks. By-pass interceptor sewer, ending at the future wastewater treatment plant (ø1000mm, L=1,950m). River bank protection-reinforcement (1,600 m). Construction of a WWTP of 86.000 PE for communal and pre-treated industrial wastewaters prior to discharge into the South Morava River. Extension of sanitary sewerage collection network (88 km) in the suburbs and rural settlements with 20.000 inhabitants to connect. Extension of the WWTP capacity – water and sludge line – to 129.000 PE. 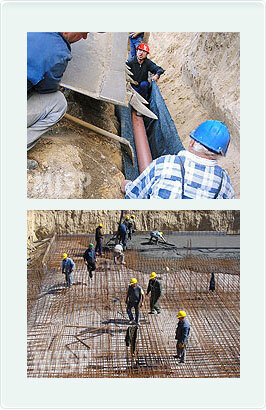 Extension of the water supply distribution system by 23 km to settlements in the north of Leskovac. To improve potable water supply, operational efficiency of the PUC-s, reduce health hazards, improve protection of health, and create the pre-requisites for sustainable demographic and economic development. To integrate a series of communal water supply systems and transform them into a technically, financially and institutionally sustainable regional water supply scheme. To optimize exploitation and improve sanitary protection of local water resources. To comply with the relevant national and EU regulations on public water supply and related public health, environmental protection issues. Improvement of operational efficiency in local PUC-s (leakage reduction, energy efficiency improvements).